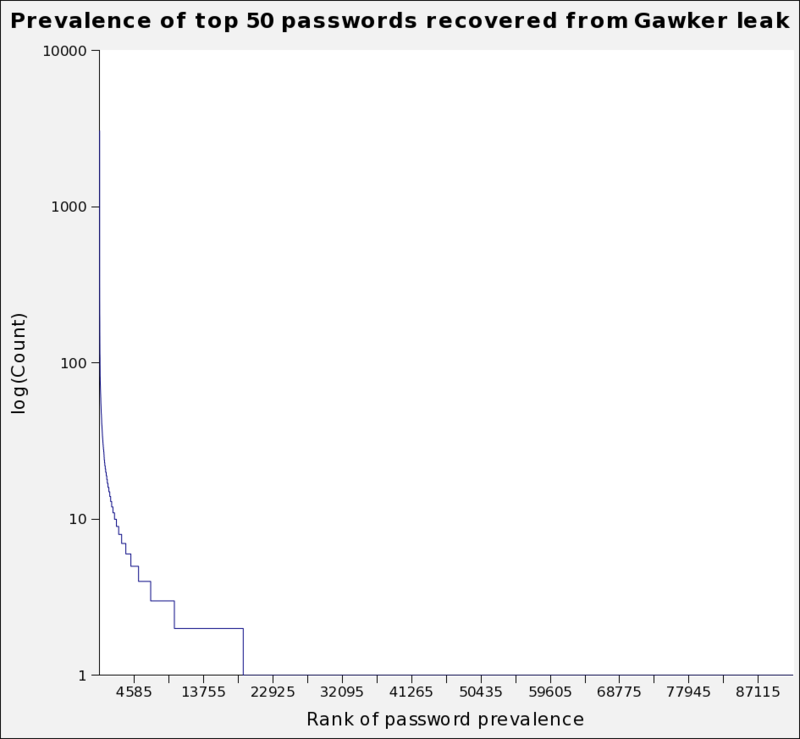 I just got an email from Gawker Media stating that their login details on Lifehacker, Gizmodo etc. had been compromised and a database of 1.3M usernames and passwords was being distributed via Bittorrent. Naturally I went and found the database and downloaded it. 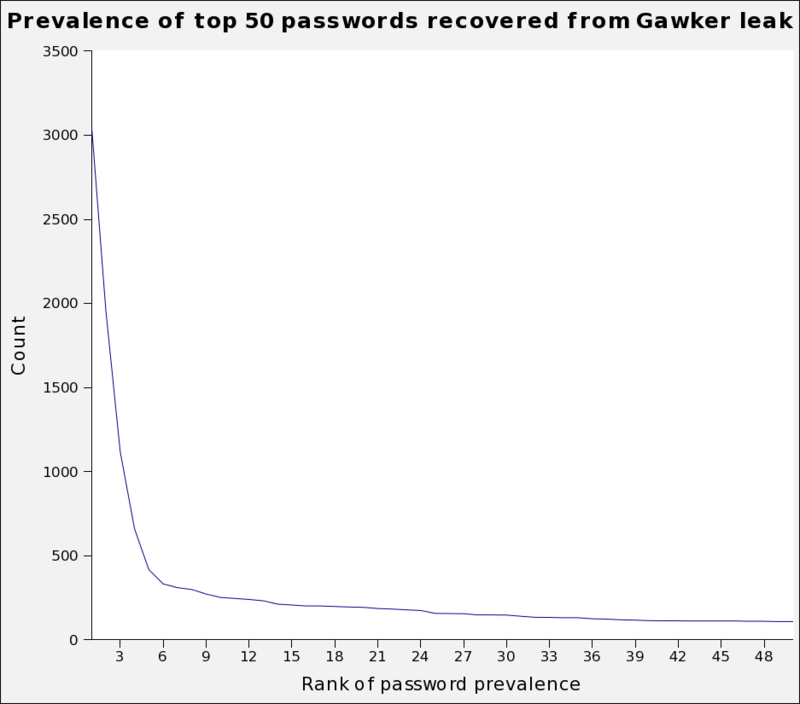 I extracted the subset of passwords from the file that have already been cracked, and uniquified and generated counts. You can download the list at the end of this post. I have written about the dangers of using one password on multiple accounts before, and when I used to work at a company where I had access to a massive password database, I was shocked to discover how many people use really weak passwords -- like a first name or a number like 123456, or the word "password". decided that 1.3 million was enough. Because of this we were only able to recover the first 8 characters of someones password! for us to have some fun with! So ~200,000 hashes were cracked out of 1.3M by de-hashing (actually 188281 hashes were cracked, producing 91688 unique passwords). 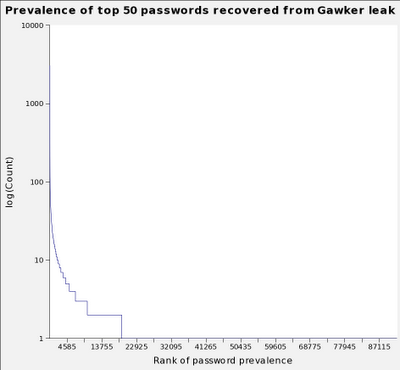 I assume that the 189k passwords that were cracked are somewhat representative of the rest of the database. 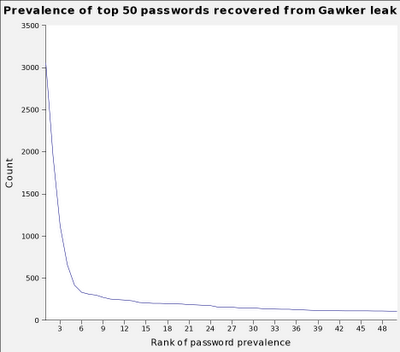 Basically the top 5 or so passwords are used by a ridiculously high proportion of users, and the top few thousand passwords are very common and therefore very easy to guess using a dictionary attack. This gives an insight into the password-setting habits (and, if you read through more of the list, the mentality) of a large proportion of the Internet-using population. Ranks and accidentally-stripped leading zeroes fixed. Highlighting one of my replies to a comment: if you have to even ask if your password is on this list, it's probably not secure enough!